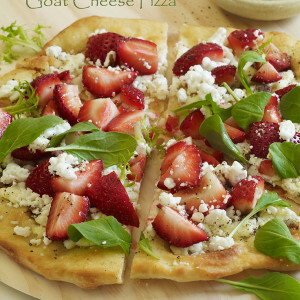 One bite of this sweet and savory strawberry goat cheese pizza and you will never forget it. As a big fan of any kind of pizza, I found this one to be especially delightful. There’s something extra special about adding strawberries in dishes and recipes that are mostly savory. Strawberries, because of their sweet and slightly tart flavor (and beautiful red color) are ideal for pizza – especially when combined with a salty goat or feta cheese. One of the best parts of this pizza is the balsamic drizzle. All these flavors dance around like a party in your mouth! In a mixer bowl, sprinkle yeast and sugar over 1 cup warm water; let stand until foamy. Add 3 cups of the flour, the salt and olive oil; mix with dough hook until stretchy and no longer sticky, adding more flour if necessary. Divide dough into 4 equal portions. Refrigerate, covered, until needed. In a small nonreactive saucepan, simmer white balsamic vinegar until reduced to 1 1/2 tablespoons. Whisk in extra virgin olive oil. In a small nonreactive saucepan, simmer aged balsamic vinegar until reduced to about 4 teaspoons. Heat oven to 400°F. On lightly floured surface, roll each piece of pizza dough into an 8-inch circle. Place on a baking sheet; bake in 400°F oven 10 minutes or until firm and slightly brown. Spread pizzas with softened goat cheese, leaving a 1/2-inch border. Toss strawberries with white balsamic vinaigrette; arrange strawberries evenly on goat cheese. Bake 10 minutes more. Remove from oven; scatter crumbled goat cheese on top. Drizzle with aged balsamic reduction; sprinkle with black pepper. Garnish pizzas with a few leaves of arugula and frisée.